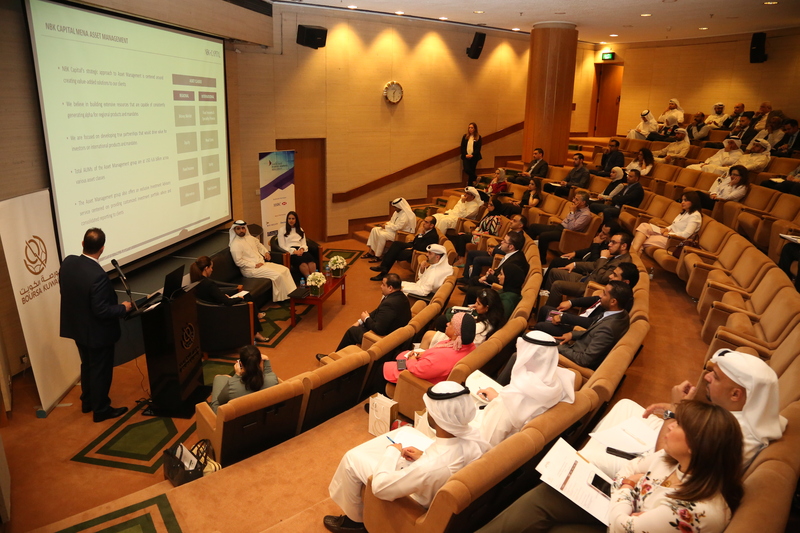 May 8 2018: Building on the outcomes of its series of workshops in collaboration with the Middle East Investor Relations Association (MEIRA), Boursa Kuwait hosted its third Investor Relations (IR) workshop, aimed at raising awareness and knowledge of the key role of Investor Relations from the buy-side analyst’s perspective. The workshop took place at Boursa Kuwait’s AlKharafi Hall on Monday, May 7, 2018. The NBK Capital executives gave three separate presentations with NBK Capital Managing Director of MENA Asset Management Dr. Husayn Shahrur highlighting the importance of transparency and visibility to national interests. “I am pleased to be a part of this workshop, which highlighted the buy-side analyst’s view of Investor Relations. Ensuring transparency and visibility reduces market risk, improves the business environment and increases the flow of foreign investment,” Dr. Shahrur said. The series of workshops conducted with MEIRA have been extremely beneficial and integral to understanding the key role of Investor Relations. After last November’s presentation of sell-side analysis, on this occasion the buy-side examined how to build a less adversarial, more cooperative relationship between buy- side and the IR officers in Kuwait. “This third IR workshop delivered by the MEIRA Kuwait Chapter in collaboration with Boursa Kuwait responses to an increased demand from the local market professionals to understand how the IR function can add an actual value to the listed companies. MEIRA is delighted to continue supporting Boursa Kuwait’s efforts to increase the sophistication of the financial markets in the country and encourage their listed companies to comply with international best practice in IR”, added Clemence Piot, General Manager, MEIRA.